Lou Reed, Bob Dylan, Tom Petty and Randy Newman at first annual Farm Aid benefit concert. Photograph by Deborah Feingold. Courtesy Corbis. What a weird and beautiful mix of dudes. I think I liked the photo better before I knew the context. It was intriguing, like any old party snapshot captured late at night on someone’s back porch — except that this particular party is full of music legends. 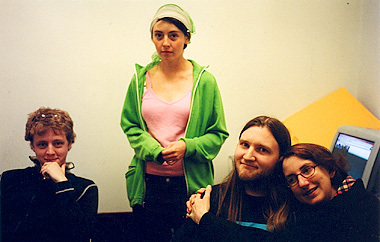 For no reason other than it’s a nostalgic shot of four people I love, just hangin’ out. And also, they are musical legends too.